You'll be £14.99 closer to your next £10.00 credit when you purchase SS Panzer Divisions on the Eastern Front. What's this? Order within the next 7 hours, 6 minutes to get your order processed the next working day! Rare photographs from SS sources illustrating the armoured formations which took part in this titanic struggle. Includes rare images of the Panther in action. The written material is as suspected quite good and on point and does well maintaining an excellent flow throughout the book. Bob Carruthers has a long line of stellar work and this book provides a very good review of the larger campaign and the role the SS Panzer Divisions played within it. It is solid scholarship and when combined with the exceptional photo expose really does make it a must have for all history buffs. Like the men and units this book details, Carruthers work is hard hitting, moves very well and may be some of his finest works on German Combat Armor and their personnel. I highly recommend adding this book to your 2019 reading list, it is superb! Documentation of Importance. Ideal source for the modeler. Read the complete Spanish review online here. Modellers will find a nice collection of various soft skin, AFV and German armour in use during this time with a couple of Russian tanks included. WWII war enthusiast should also be very happy with selection of images. There are a number of photos from the fighting at Kursk that are of particular interest. It's another must-have book in Pen & Sword's highly collectable image book series. A new addition to the highly popular Images of War Series. 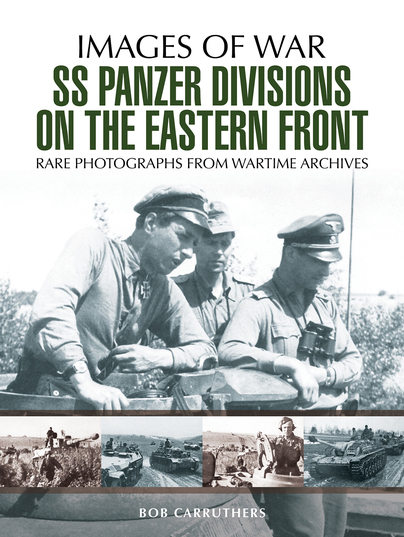 This book provides a pictorial review of the SS Panzer Divisions deployed to the Eastern Front. Once again, a superb selection of rare images from wartime archives is supported by clear introductory text and captions – Very Highly Recommended. The Images of War series of archive photo references continues to grow at a steady rate, a clear sign of their populariry. One of their recent additions is this one on the topic of SS Panzer Divisions and their combat operations on the Eastern Front, between 1941 and 1945. It is also another title in the series from author Bob Carruthers. This one is started with 8 pages of text which give the Introduction, the story of the SS Panzer Divisions in Russia and Eastern Europe through to the end of the war. This is followed by a fine collection of archive photos, the bulk of which I had not seen published before. These are presented in a chronological order which tackles the war over the years from 1941 to 1945. All have helpful captioning. For the WW2 historian and for the military modellers there are lots of useful references and diorama inspiration to found within the photos. It also shows the changes in vehicles, equipment and uniforms over the years. From the light AFVs and assorted trucks of the early period, through to the significantly larger and more heavily armed Tigers and Panthers in the later period. We also see the different weather conditions they faced, from hot and dusty summers to the thick mud of wet winter and spring. The wide open spaces of the Russian Steppes and stretching as far as the eye can see, and the wooden houses of countryside villages. As the author notes in his introduction, the SS were responsible for a number of atrocities during the fighting but the tough nature of the fighting SS units could be symbolised by their standards being displayed at the head of the Soviet victory parade at the end of the war.. Another nice addition to the Images of War series to add to your bookshelf.